A grill capable of handling the heaviest moose soup pots in action, October 15th, 2017. Local event organizer Rodney McCord wants to build one for such community events. 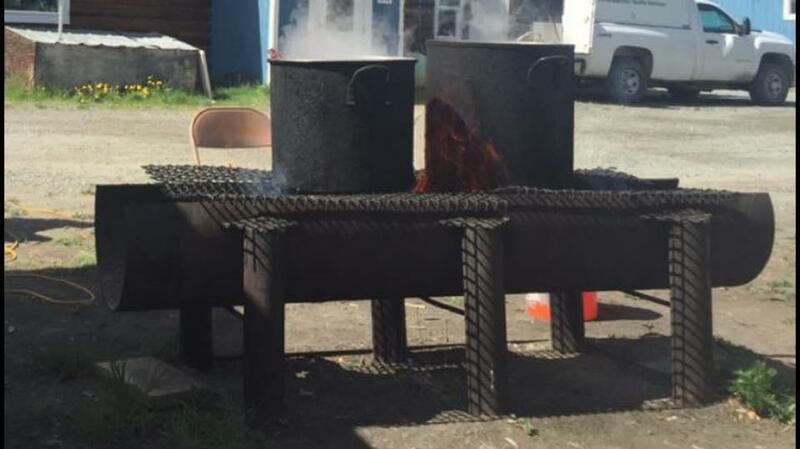 An event tomorrow is aiming to raise funds to revitalize a Potlatch tradition. 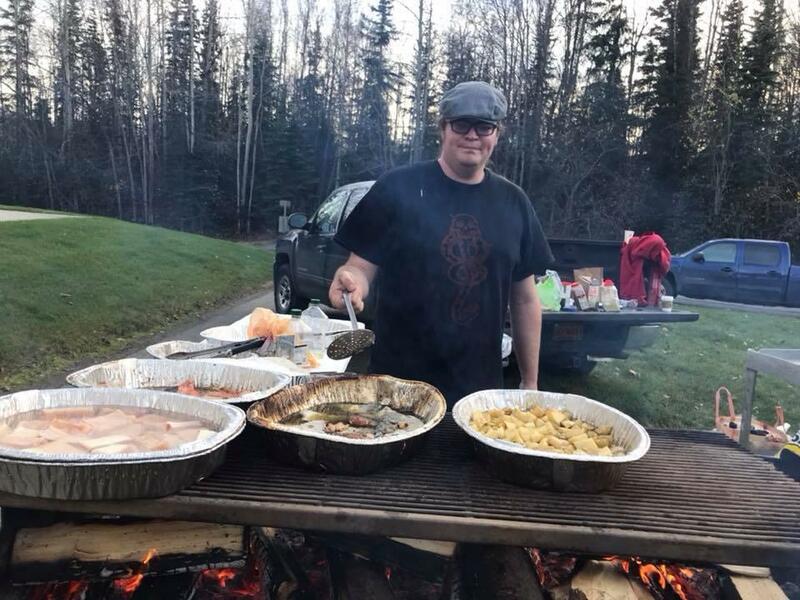 After a successful event during the first week of the 2017 Alaska Federation of Natives Convention called “Decolonizing the Dream, Honoring Our Sacred Mother,” a local man is looking to continue the tradition of hosting large Native gatherings by building a huge grill. Rodney McCord is from Tyonek originally, and has Dena’ina heritage. For the event last October, he drove about 200 miles to borrow a large, steel grill, that looks like half of an oil pipeline with an iron mesh on top for the grill surface. The tailgate could barely close on the full-size truck he borrowed. While he was thankful to use it, the 7-hour round trip added considerably to the planning for the event. The wood-fired grill appears to be large enough to hold and heat several dozen servings of different dishes at one time. The grill would be used for moose and fish during the large gatherings, sometimes for hundreds of people. McCord says he’s seen other communities rally together and wondered what was missing in Anchorage? Part of it, might be the huge grill – as Native people love to feed each other for large gatherings. Today’s guest on Our Community is Rodney McCord – and he’s an emerging young leader and part of the local Athabascan tribe, originally from Tyonek. Alaskans get their first chance tonight (Thursday) to tell legislators what they think of the centerpiece of Gov. Bill Walker's fiscal plan for the state. The Senate State Affairs Committee will begin hearing public testimony at 5:30 p.m. on Senate Bill 128, which would direct $3.3 billion annually in Alaska Permanent Fund earnings and other state funds to the state budget.